Objective This narrative review sought to (a) characterize prevention programs that have produced reliable, reproducible, and clinically meaningful effects in efficacy trials, (b) discuss effectiveness trials that have tested whether prevention programs produce intervention effects under ecologically valid real-world conditions, (c) discuss dissemination efforts and research on dissemination, and (d) offer suggestions regarding directions for future research in this field. Conclusion A literature revealed that 6 prevention programs have produced significant reductions in eating disorder symptoms through at least 6-month follow-up and that 2 have significantly reduced future eating disorder onset. Effectiveness trials indicate that 2 prevention programs have produced effects under ecologically valid conditions that are only slightly attenuated. Although there have been few dissemination efforts, evidence suggests that a community participatory approach is most effective. Lastly, it would be useful to develop programs that produce larger and more persistent reductions in eating disorder symptoms and eating disorder onset, focus more on effectiveness trials that confirm that prevention programs produce clinically meaningful effects under real-world conditions, conduct meditational, mechanisms of action, and moderator research that provides stronger support for the intervention theory of prevention programs, and investigate the optimal methods of disseminating and implementing evidence-based prevention programs. Stice, E., Becker, C. B., & Yokum, S. (2013). 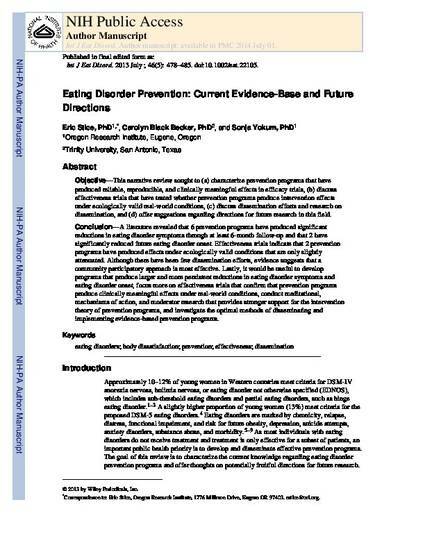 Eating disorder prevention: current evidence-base and future directions. The International Journal of Eating Disorders, 46, 478-485.